For Regulatory Requirements compliance it is essential that in the qualification of equipment and processes; you generate and put into place precise and properly scoped documentation. This is the only way to guarantee that a project of this nature will be completed satisfactorily, on time and compliant with FDA-GMP. When documentation is properly specified at the very onset of a qualification program then there is time for peer reviews to probe, comment and possible amend document layouts, scopes, definitions and above all else 21 820 or 21 CFR Part 820 compliance. It is also of the utmost importance to ensure that the documents flow chronologically. I.E. you cannot approve a document that relies on data from another document that is not yet approved. 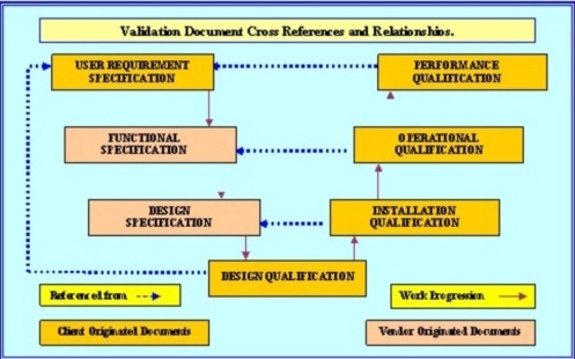 The required sequencing and inter relationship of the necessary compliance documentation is illustrated in the Validation Plan (VP) diagram; (Diagram A, shown below). All these documents are mandated. There are many manufacturing processes that produce a product or part of a product that cannot be tested without damaging it, or indeed destroying it. The introduction of Quality Assurance (QA) allowed manufacturers to build and destructively test; such products. Then using rigorously enforced Quality Control (QC) replicate the tested product exactly, now knowing its performance and limitations. Pharmaceutical, biotechnical and medical device companies must demonstrate to the regulators that their whole operation is under similar control. Quality Control that will ensure all operations are documented, all materials are verified as correct and all equipment is qualified as fit for purpose. All this Compliant Documentation must be in place and in operational use, prior to receiving regulatory requirements approval to manufacture. This status must be maintained to a standard that ensures consistent replication of all the production processes and without ever compromising the quality of that product. The maintenance of these standards is called 'current Good Manufacturing Practices' (cGMP). This qualified or approved state is subject to continuous ministering and inspection by the regulatory requirements authorities involved, as long as the product is in production. Class I devices: Devices that are defined as non-life sustaining. These products are the least complicated and their failure poses little risk. Class II devices: Devices that are more complicated and present more risk than Class I, though are also non-life sustaining. They are also subject to any specific performance standards. Class III devices: Devices that sustain or support life, so that their failure is life threatening. Identify and evaluate quality-related problems. Recommend solutions to quality problems and verify that any problems have been resolved (corrective actions). Initiate action to prevent the occurrence and re-occurance of quality problems (preventive actions). Control non-conforming products until corrective action has been taken in accordance with CAPA procedures. Set quality goals and objectives for the company and develop plans to meet those goals and objectives. Report to Management on quality related issues. The FDA-GMP and quality Assurance department is responsible for quality systems and 21 CFR Part 820 compliance, but implementation of these systems and quality per se is the responsibility of each director, manager, supervisor and employee. For medical devises there are in FDA-GMP and Part 820 quality system regulations concerning design controls. Design control is a formal process that takes product design through a series of defined activities, from identification of product regulatory requirements and specifications to rigorous product testing based on user needs. Each manufacturer shall establish and maintain procedures to control the design of the device in order to insure that design regulatory requirements are met. These procedures should meet the intent of the FDA-GMP Part 820 Quality Systems Regulations (QSR5) for medical devises and the integration of regulatory requirements and include methods used in, and facilities and controls used for, the design, manufacturing, packaging, labeling, storage, installation, and servicing of all finished devices. This would include the initial design efforts and consideration of all subsequent changes. Design Review is an important concept in the FDA - GMP, 21 CFR Part 820 device regulations. These reviews must assure adequacy of regulatory requirements specifications testing and test results. These reviews must also assure appropriate traceability from all the regulatory requirements to specifications to testing and test results. Traceability shows that design input is linked to design output, and has been verified and will be qualified in the Design Qualification (DQ). When designing devices, the practitioner needs, as well as patient needs must be considered. Use of focus group studies and customer input is invaluable. Where possible, devices should always he designed to assure that practitioner performance and the device combine to meet patient needs with a high degree of assurance. There are a number of variables that can in the performance of individuals using equipment and devices. Sometimes errors in use can cause harm to the patient or the health care provider. Therefore, the device (including labeling and instructions for use) must be designed in such a way that minimizes errors that could cause injury to the patient or health care provider. Some rules of thumb that are worth considering are included in the FDA publication called “Do It by Design". Risk analysis is another tool for considering design factors. A documented risk analysis, or a justification for why a risk analysis is not needed, must be developed and is required to be completed for each device that is being validated. The results of any risk analysis should be evaluated and any significant risks should be appropriately mitigated. Where possible or appropriate, risk analysis techniques should be extended to processes as well, (see the FDA guidance on Hazard Analysis for Critical Control Points, HACCP). Determine the possible variables that may affect the process and its output. Select measurement instruments and methods based on the parameters and ranges for the settings and conduct evaluations of test and measurement uncertainty for all measurement instruments and methods. Investigate the influence of these factors on the process behaviour and determine the processing windows as a basis for the final process design. This may he done by input from subject matter experts and so called ‘screening design of experiments’ where the major factors are defined. Further evaluate the process using a design of experiment focused on process robustness (e.g. a Taguchi experiment), where the process is varied within the processing ranges to assure that product quality is not excessively degraded by normal process variability. To determine if the process functions reliably within the process ranges. Process Capability and Process Performance studies maybe performed. To get a reliable estimation of the Process Capability (Cpk) over time (process performance). the sample size must be sufficiently large and appropriately stratified to assure that a complete cross section of the population is included in the sample. Where process capability and process performance does not yield a high enough degree of assurance of conforming product, sampling plans and verification methodologies must be designed that appropriately segregate conforming from nonconforming products. The validation plan must include the impact on the validation that resulted from the risk analysis for the device. The validation plan must also include at least one design review at the end of validation activities and prior to market release. Other design reviews at the end of various phases of development are also recommended to ensure FDA-GMP and 21 CFR Part 820 compliance. Performance Qualification — approved documented verification that a system, while operating in its normal environment over the expected operating range and capacity load for a specific process, performs as intended. Process Validation — approved documented verification that a production process will consistently result in a product that meets specifications. Design Validation - Ensures that devices conform to defined user needs under actual or simulated use conditions. For most devices, in-process and finished product testing still play an important role in ensuring that products meet specifications. These verification processes may be part of both validation and routine production. The following apply generally to any Performance Qualification (but are important enough to emphasize here again. Challenges to the process should simulate conditions that will be typically encountered during actual production. Challenges should include the range of conditions allowed in standard process operating procedures and should be repeated enough times to ensure that the results are meaningful and consistent. Challenges may need to include forcing the preceding process to operate at the allowed upper and lower limits. Performance Qualification assures that finished product characteristics are met even if process parameters and process outputs are at the edge of normal operating ranges. A variety of operators that have been trained on the process should he used to assure that training methods, batch records and procedures are adequately challenged during validation testing. operating conditions on initial production units, or their equivalents. 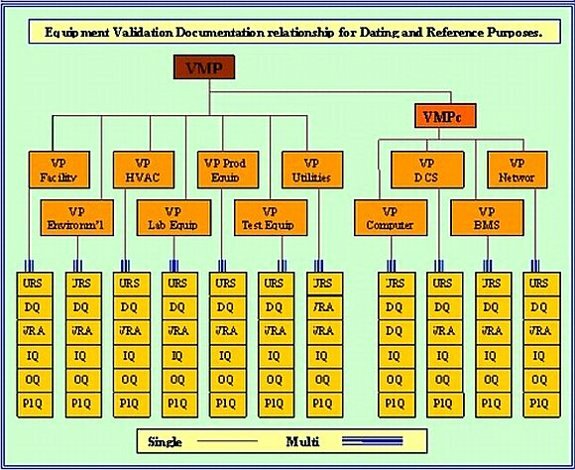 Process validation and design validation using initial finished devices are closely related. Design validation can be conducted using finished products made during process validation studies. Design validation shall ensure that devices conform to defined user needs and intended uses and shall include testing production units under actual or simulated use conditions. User representatives and focus groups are recommended to assure that the design and directions are adequate and can be understood by the user. Instructions for use must be properly written and translated to assure that the intended use of the device is clearly communicated. In addition to the regulatory requirements already discussed, a reference should be made to the location of protocols and validation results in the Design History File (DHF). The operational monitoring and other production-related procedures are part of the device master record (DMR).